Another year gone, another blog post about it. This year wasn’t nearly as productive as 2012, but we all have our slow periods. I have a good feeling about 2014, and as always am excited about moving on to the future. I guess the coolest thing that happened this year is that I made it to the MWKF tournament in Chicago again. I got my first tournament match win, and passed my shodan exam. 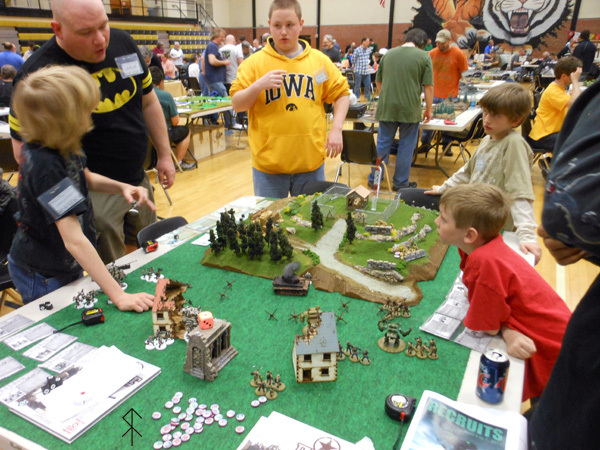 I helped out with the 435th Dust Warfare Club’s demo games at the Recruits convention in Kansas City. 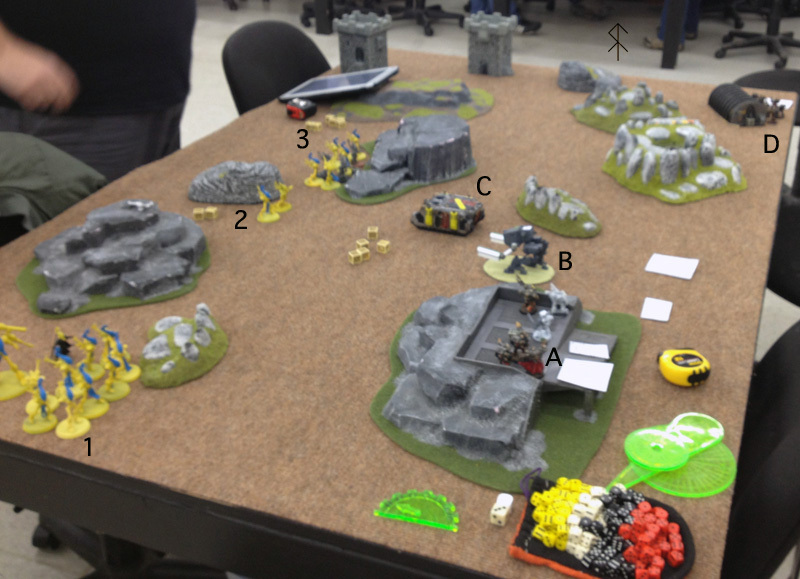 The most important thing about this is that the 435th has sort of morphed into a design collective, and we’re making our own tactical skirmish game with the intent to publish. There will be more updates about that in 2014, for certain. 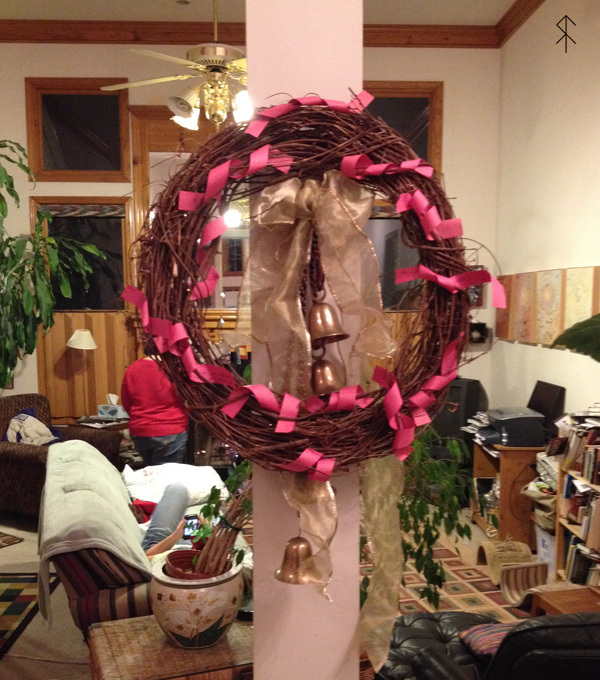 The family’s 2013 Yule Wreath. I haven’t done as much with the local Heathen community this year, but family is the all-important aspect of it as an outlook anyway. If I had to guess, I would say that it was the Straight Outta Comicon guys searching themselves on the net, but who can say? By “some” they mean “all.” I really didn’t post much on the old blog this past year. Nobody is really interested in my movie or book reviews, unless it’s the one on Ben Franklin, which I suspect is mostly kids doing homework anyway. “Fancy drinking fountain?” I have no idea. It does not surprise me that everything else about this picture is gaming related, though. 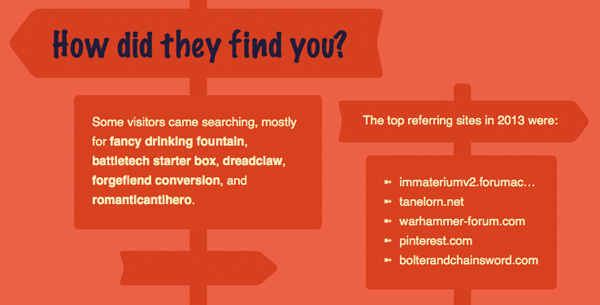 Wait… Pinterest? What is that about? 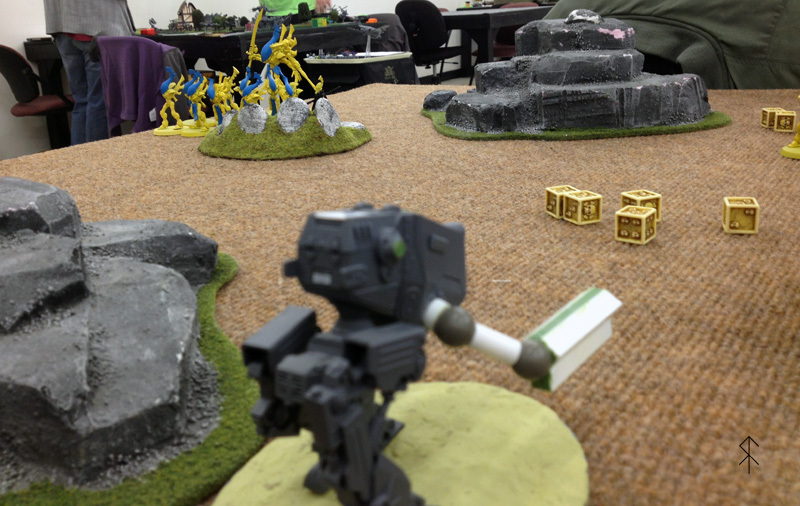 I’m going to go out on a limb and say the one guy looking at RA from Afghanistan is a British or American soldier looking at 40k stuff. Pakistan? Now that one is a mystery to me, unless it was the short blurb I wrote about religious extremism in India. Which is probably why India is also sort of blue. China? I honestly don’t know. 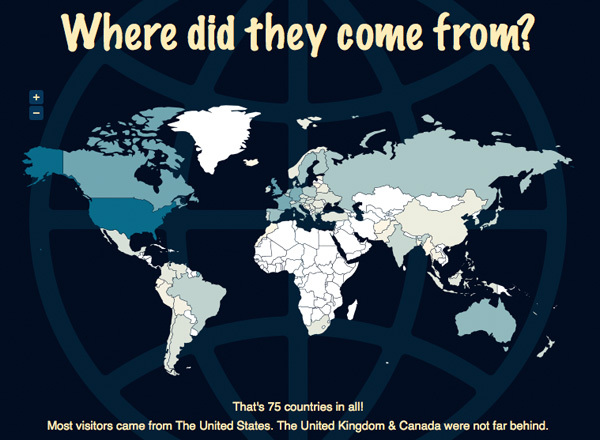 Pacific Rim was a popular movie there from what I have heard, so maybe it was that post. Or 40k, because that’s a global interest, really. 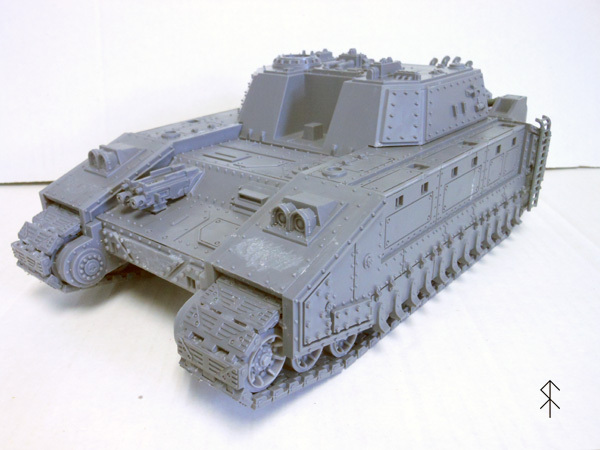 In fact, it’s most likely that anybody looking at this website is trawling the internet for 40k conversion pictures. Yep, numbers going way down this year. 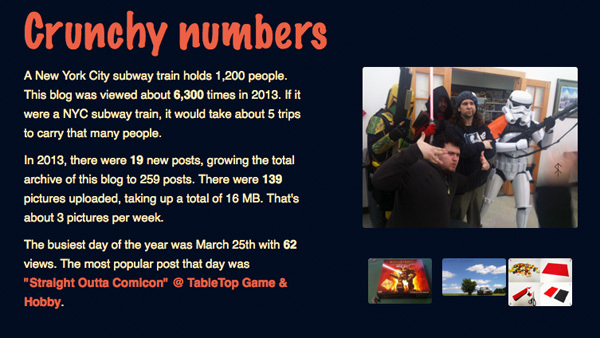 That happens when you forget you even have a blog for long stretches of time. I’d like to image it’s because my clever and deep webcomic “Iron Lawyers From Mars” is on an unofficial hiatus, but I know that it’s only ever got views because I only really updated it when I was living in England back in 2010, and it was confusing my parents and friends back in the States who wanted to know what I was doing over there. Escalation came out in 40k this past year, giving me a reason to finally start assembling this. I’ve also started Gunpla as a hobby, which currently consists of buying kits and putting them on the shelf. Sort of like my model helicopter hobby… I’ve done some good reading this year, but again, not as much as I’d like. Writing? The only things I’ve written this year, outside of my kendo exam paper, were related to the skirmish game I’m part of developing. I can’t show anybody that stuff yet, but I can’t wait to get that stuff out there. 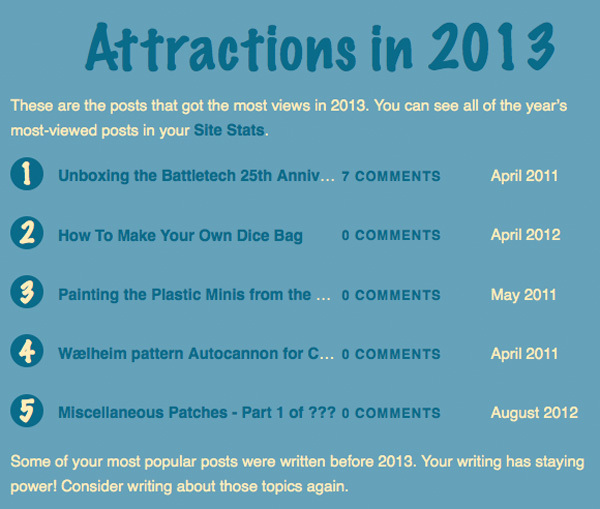 Hmmm… I also wrote some things for an ill-fated web magazine this past year, as well. Two articles on gaming that I thought were pretty good. Unfortunately that project petered out, because I think all contributors realised that working for free wasn’t as fun or rewarding as we thought it would be. Maybe I’ll post those articles on RA for posterity, since I still have them. What to expect in 2014? More movie and book reviews, more modeling and painting posts, exciting updates on the 435th Design Group project, the usual kendo annual events, and at least one short story and one poem (which is a promise to myself more than to readers.) I’d also like to get around to redoing my Budo and Heathen Gods sections of this blog. What I want to do with those keeps changing as my focus changes. It’s going to be a lot more personal and less theory related, but it will be there. I’ve finally come to terms with Christmas, replacing it completely with Yule in my heart and mind. Now, “the Christmas season” is something else entirely. Black Friday both repels and fascinates me. Watching the riots and fights and “mob shopping” on youtube has become a thing for me. But when proper Yule finally comes around and the Yule Wreath goes up at my folks’ house, all that negativity goes away. Hopes, dreams, and promises for the coming year… it makes me feel so good. 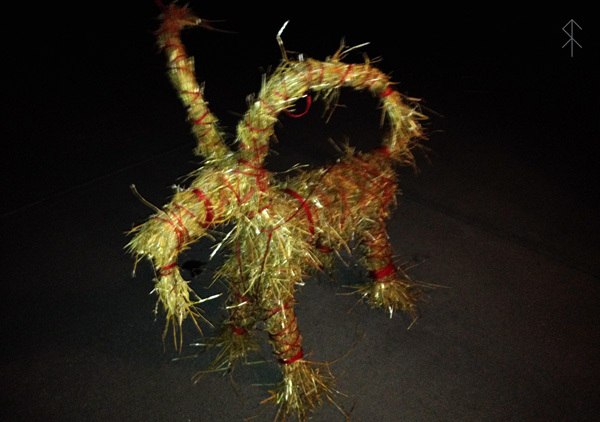 This was the 2013 Yule Goat. 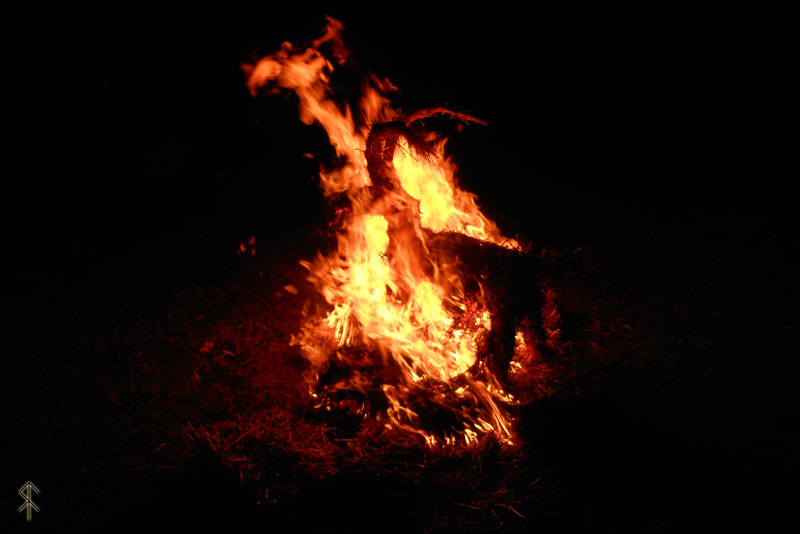 Unfortunately I didn’t make him early enough that he stayed with us throughout the whole holiday season, as I believe is traditional now, but he was still a fine goat. There was a lot of trouble with cars starting right before Yule and lasting throughout, but everything that needed to be done eventually did get done. Ma and Pop watching the New Year’s Bonfire in the snow. Moments before the previous picture, the Yule Goat and Yule Wreath finally getting started. Every year I forget that Kansas has a steady wind that is decidedly uncooperative with anything to do with matches. 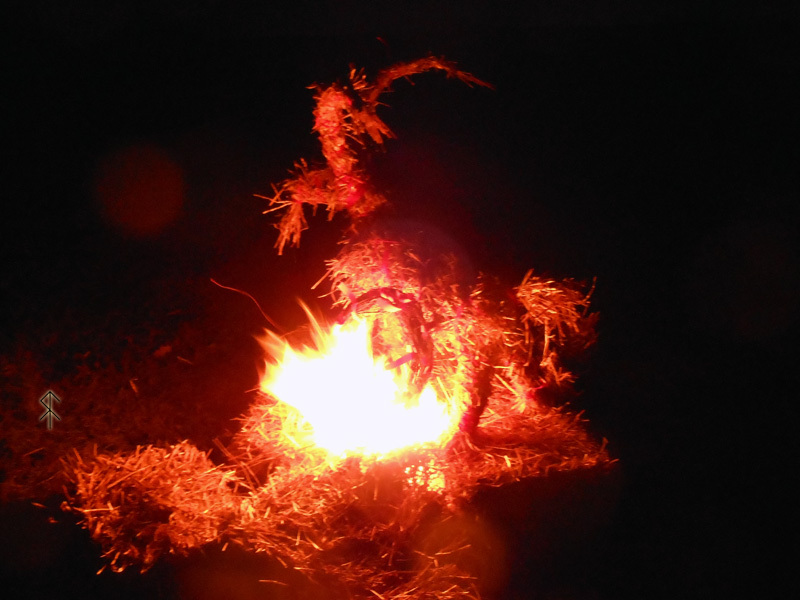 Note to self, and to anyone else who wants to do this: make a little hole in the pile of straw beneath the wreath to get the fire started. The wreath itself will go up quickly, starting the goat. Once the goat gets started on the Helheim Road, it doesn’t dally. This image is my new desktop! 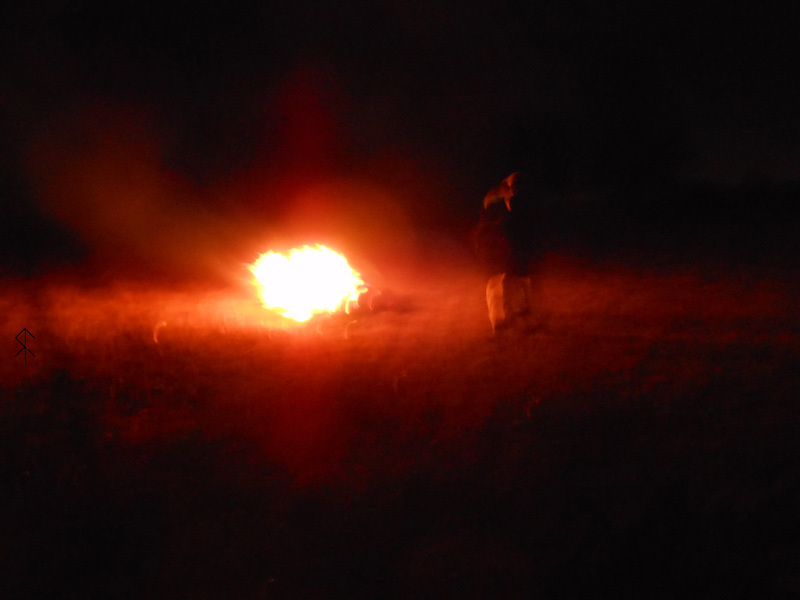 It was a lovely bonfire. Our family had some setbacks this year, but our luck is strong and our wyrd well guarded. We put 2013 to rest in grand style, and are moving forward into 2014 with hope and strength. 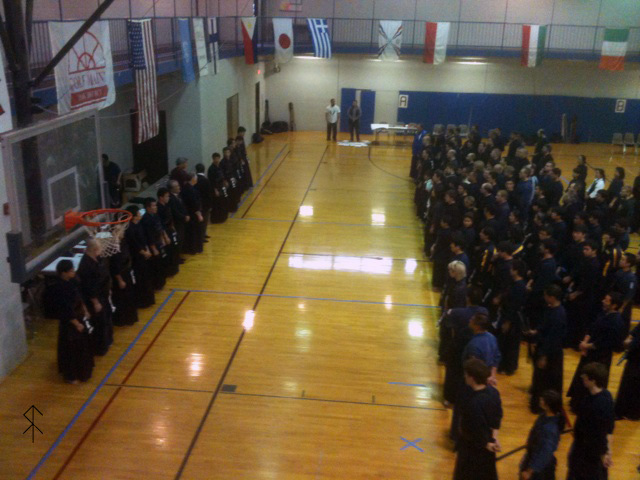 The first weekend of November I went to Chicago to participate in the tournament with my fellow Kansas City Kendo Club members, and to test for 1-Dan the day after. Here’s some pictures and a little bit about the event. Stretching while we waited for the tournament to start. 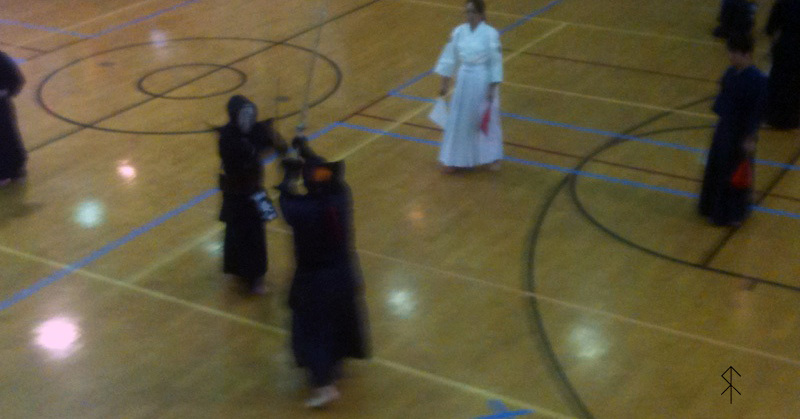 This is the second tournament I’ve been to, the first being back in 2009. There were only five of us this time, but that also meant that everyone got to be on the team during that portion of the event. The first time I went I was very excited and a little bit out of it because of all the newness. 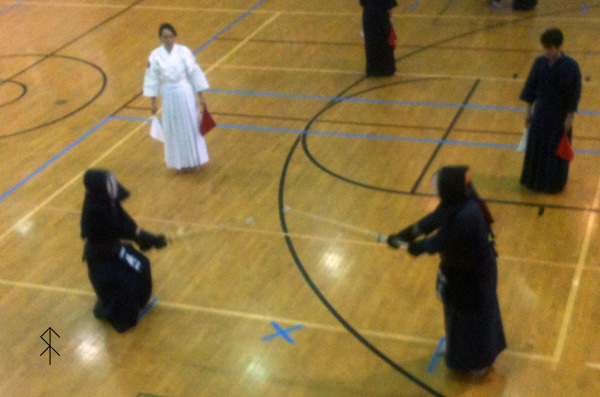 This time everything was more familiar and I felt much more confident (not necessarily about kendo, but just being there,) so I got to pay more attention to what was going on around me. Or to me. Ma came with me this time. She took a handful of pictures, some of which I am posting here. This is everyone lining up at the opening ceremony. I think it’s cool that they do this, because it makes it feel like we’re doing something a bit more uplifting than just gathering to see who is better than who. It sort of makes me feel like we’re all on the same team to some extent. A shot of just the players, getting a better idea for what attendance was like. No, I’m not in jodan. I’m mid-swing, probably about to get popped in the kote. I don’t even remember what points I gave up, but I know it was 2-0 at the end. I was concentrating on trying to control the pace and wait for an opening. That just did not work for me. My partner had much more aggressiveness and a better sense of what was going on. So, I lost. Ma didn’t take any pictures of the team match, so here is a shot of the youth singles tournament. I liked watching the youth division matches. 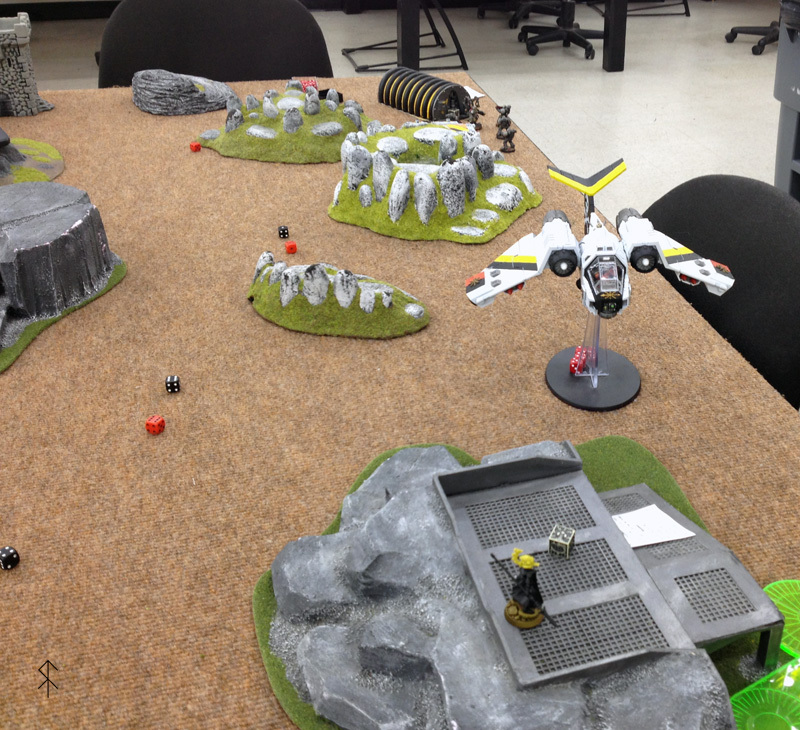 But the team match: I won my team match game, which was my first ever tournament win. I took the advice to be more aggressive to heart and determined that if I went down it wouldn’t be for lack of spirit. I don’t remember the final score, but I know I gave up at least one point to my partner. Pretty exciting stuff! We cheered each other on during the match, which is nice to do. Not a lot of teams did that, I noticed, but I think it shows club spirit. There aren’t any pictures of the testing the next day; Ma went to the museum downtown. The original idea was that maybe we’d have time to go together on Saturday, but the schedule didn’t allow for it. I mentioned being more aware of what was going on than last time. That definitely helped during the run-up to the testing, but once things got started I was just as confused as last time I tested. There was lots of standing around and practicing kata and whatnot, all the time in the world, and then suddenly everyone was running to go line up and I didn’t know what I was supposed to have in my hands. So I took everything. 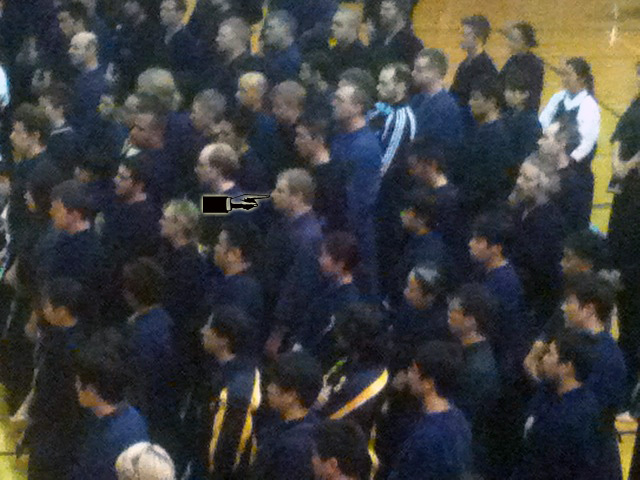 I lined up and got told where to stand, then where to sit, and then where to stand while waiting for my shinai portion of the test. I wanted to show the same passion and vigor as I did during the team match the day before. I wanted to not get too fancy, but also to show some skill beyond just gunning for men. It can’t have been more than two or three minutes, but I felt like I was going to die from trying so hard! We made what felt like ten thousand passes, and I started to think that maybe they were going to see how long it took me to get too tired to spar, but eventually it did end. 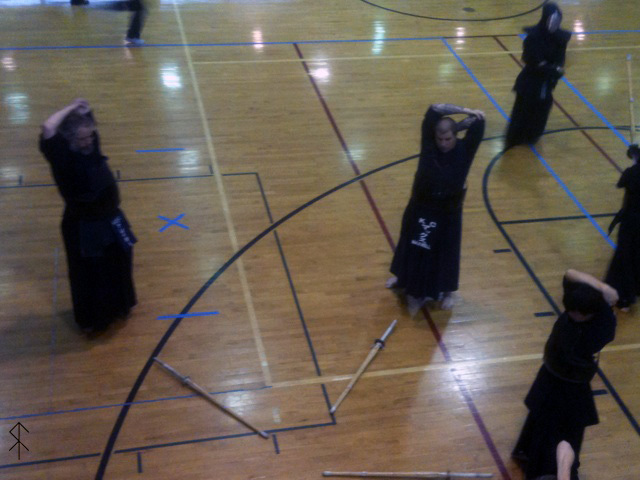 The kata section was where I felt sure that I would have problems. I almost did, actually. They lined us up in pairs and I was thinking that they would watch us one at a time, but after a bit I realised there was a man who was saying something in Japanese, and about halfway through his short speech I realised he was directing us all to begin! I believed I was uchidachi, and was relieved when I saw someone across from me in one of the other pairs assume the basic jodan. There were some distancing issues in a few places, but nothing one or the other of us didn’t compensate for. Over all I think it went fairly smoothly and was glad for a good partner, and that I didn’t forget to center up at the end of gohonme before sonkyo. And that I didn’t totally flub yonhonme, like I often do during practice. The opening part of that kata causes a lot of issues for me. Everybody in my group passed both parts and got to hand in their papers. If anybody is curious, I wrote my paper on ki-ken-tai. Just like I posted my ikkyu paper on kirikaeshi (which looking back on I think I could have done better writing), I’ll post my ki-ken-tai paper in the Library section of the site. If I get a letter saying I failed based on the paper I will update RA with that information, I guess, but it’s probably OK. 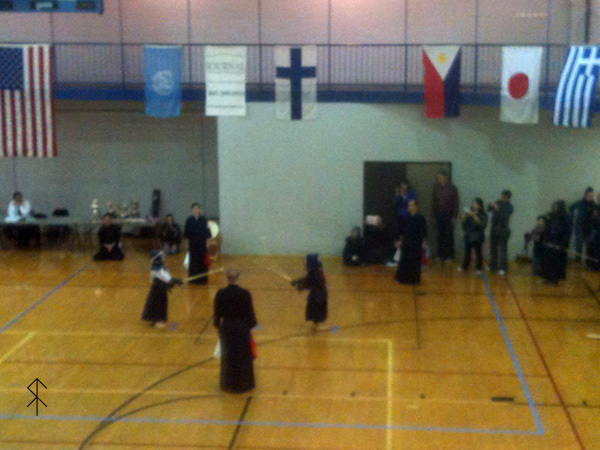 Writing a little bit late here, but October 5th was the Kansas City Japan Festival, and once again I went out in support of this event with the Kansas City Kendo Club. As always it was a good time. I saw not as many familiar faces this year, but that may be because I was very focused on the kendo portion, and was also feeling the onset of a cold. I dragged myself out of bed and down the highway, knowing that once I got there I’d feel better, but not very motivated at all when I woke up. There was little build up to the demo. It was at 1300, I think, and when I got there almost nobody was in the Fountain Square. 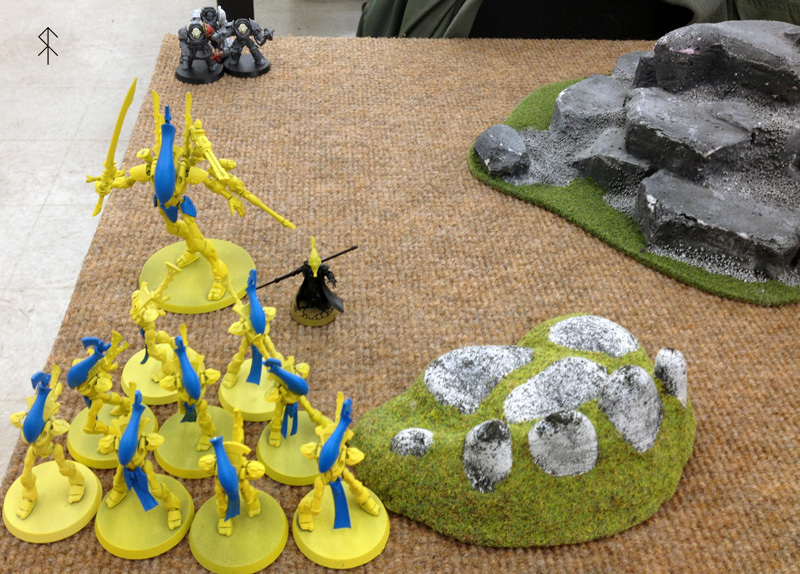 The club began trickling in, and then promptly at 1300 there was a sudden crowd. A lot of smaller school children, all wearing the same T-shirt, probably somebody’s entire class for some reason. 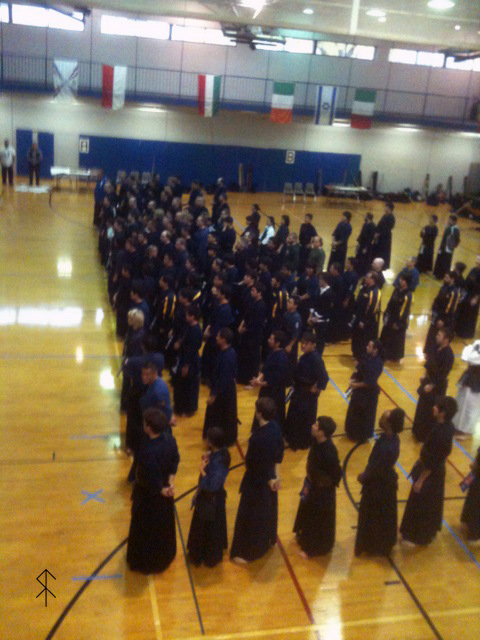 At first I didn’t think we’d have enough people, then I didn’t think we’d have enough shinai, but it all worked out. Somewhere in the middle of the workshop the schoolkids disappeared and were replaced by random folks, and I didn’t see that happen but just noticed it. For the workshop we did a basic introduction course. We don’t really do anything special or fancy, it’s sort of like we’re having a normal practice and a bunch of new people just happen to show up. Whenever that happens on regular nights it’s footwork – footwork – footwork – how not to kill yourself. The crowd always gets really hype when we let them line up and hit us. I tell you, there is always ONE person, normally a small child, who does their level best to hammer you into the ground. This year it was a grinning little girl of maybe six. I never forget my extra wrist pad for these things. After I walked around and did a quick spin through the merchant area. It seems like every year there’s one more manga and anime knick-knack seller, and they’re all about the same level of cruddiness. There was a group selling handcrafted clay stuff, and they were pretty cool, though. Also there was the usual jumble of stuff sold by the Japanese ladies in the big room, like books and magazines and whatnot. I wanted to get in the line to look at the children’s books, but it was long. Then I thought about how I never really do anything with the ones I’ve already bought, so left off.I though about getting some Japanese snacks, but like the anime and manga stuff there really isn’t anything there you can’t get locally anyway. I take that back, I saw an Azumanga Daioh statuette of Tomo and Father than I had a spasm of desire to buy, and there were some Yotsuba statuettes too. But I really have no use for vinyl stuff like that, especially at those prices. But yeah, I skipped the snacks and wen to the cafeteria area for real food. I was surprised when I got to the register and some yakitori, rolls, and a can of Dr Pepper was $16, but I didn’t want to put it down after I had it on my plate. It’s good stuff, but it’s not $16 good. So, there was that. Like this year’s Ethnic Enrichment Festival, a couple of us took the time after the workshop to do a little unsupervised sparring. Mr. A and myself had a go at one another, and I enjoyed myself. The grass was uncut and wet, so we were limited to where we could spar without breaking our ankles, but we managed. I think I saw one of my old classmates from Japanese class and wanted to say hello, but he appeared to be doing something with bokuto and I was doing the sparring thing. I don’t see as many folk from school at these things as I used to, and this year I didn’t even see any of my old teachers, which is unusual. The Japan America Society folks greeted me with the usual warmth, though, and I look forward to that. They are nice folks, and I really need to make the time to go those meetings again. There was some talk about the upcoming tournament and testing in Chicago. I think five or seven of us are going, one of which is myself, and I am very much looking forward to it. Still working on the travel arrangements and hotel room, but most everything else is in order. I need to get a draft of my essay question to sensei this week. I think I’m doing “explain ki-ken-tai-ichi”. My plan is to do the first draft tomorrow evening. On a side note, I also went to Fall Recruits 2013 this year. I didn’t do a blog post about it when it happened, mostly because there really wasn’t anything to say. I understand they’re only doing the fall convention from here on out, and this year with the change in coordinators it seemed a little under-attended. 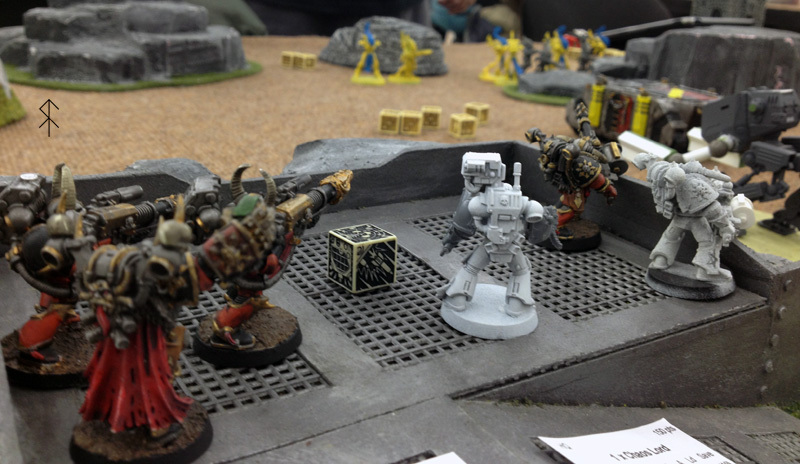 I’m told there was more stuff I didn’t see downstairs, including a 40k grab box thing that Mr. B failed to tell me about when he reported back from his scouting (him not having an eye for 40k things…) but at any rate, it just seemed subdued. I did get to sort through a bits bin and got four lascannons and a servo-arm back pack for $2, so I felt pretty happy about that part, at least. Returning to kendo, it’s starting to get dark and cool these days. I want to move to Saturdays, but this weekend didn’t have the gas to go. I’ve been talking with some of the others about getting the indoor practices up and running again at least once a month. I don’t really mind doing kendo outside, but when I can’t see and when it’s too cold to take shoes off, well, I just don’t go anymore. Depending on the weather I may go through December, and there’s early talk of actually pulling off a First Practice on New Year’s this season, but in general I don’t really get anything but cardio exercise out of practicing in the snow. Not that I don’t need it, but I’m always super paranoid about popping my knee out on the slick ground. That’s the sort of thing that could put me out of kendo for months, and I don’t want to risk that over “snow kendo” bragging rights. I guess that’s it, because I’m rambling. So yeah, the annual culture fest was fun, and the club had a good showing!